Renowned On-Air Personality, Daddy Freeze, has shared a phone conversation he had with a man named Kenneth who complained about his church's refusal to return a sum of N111,000, he mistakenly paid as a tithe. The complainant who intended to part with N11,000, revealed that he made payment via an online transfer but had found out after the service at Gloria Arena, Benin, that he had exceeded the planned value. According to Kenneth, the Edo-based worship center insisted on holding on to the money claiming that it has already been submitted to God. Daddy Freeze, who has established himself as a figure who has taken a reproachful view concerning the enforcement of tithe payment struggled to contain his emotions in a chat with the church-goer. "Last week something happened. Somebody gave me money for something - for a project. So I went to church service but we normally use POS in the church. "I wanted to type eleven thousand, my tithe so mistakenly I type a hundred and eleven thousand. So it was after the closing of the church that I saw the mistake when the alert came. "That money was sent to me for something - someone that was building, the person is sending the money for me to complete the window part of the building. "So I went to them to tell them... They said that it is not possible that I have given the money to God and that is...," Kenneth said in the audio recording. At the tail of the conversation, Daddy Freeze was heard muttering an appeal to the Gloria Arena in a bid to have the money returned. 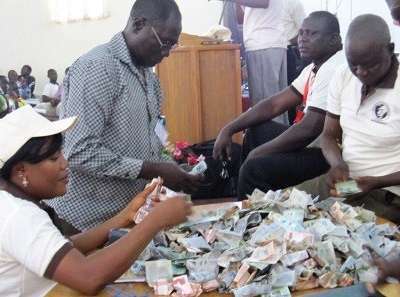 The latest incident has put the OAP in the spotlight of another aggressive criticism of what has seemed like the use of fear tactics to motivate a church congregation to pay tithe, which has chiefly served pastors believed to enjoying an extravagant lifestyle.